Fluocinolone acetonide intravitreal implants have been used to treat non-infectious uveitis. A systematic review could not determine whether fluocinolone acetonide implants are superior to standard of care treatment for uveitis. It was patented in 1958 and approved for medical use in 1961. 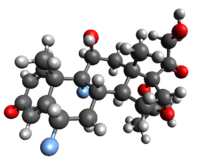 Flucinolone is a group V (0.025%) or group VI (0.01%) corticosteroid under US classification. ^ Brady CJ, Villanti AC, Law HA, Rahimy E, Reddy R, Sieving PC, Garg SJ, Tang J (2016). "Corticosteroid implants for chronic non-infectious uveitis". Cochrane Database Syst Rev. 2: CD010469. doi:10.1002/14651858.CD010469.pub2. PMC 5038923. PMID 26866343. ^ Fischer, Jnos; Ganellin, C. Robin (2006). Analogue-based Drug Discovery. John Wiley & Sons. p. 485. ISBN 9783527607495.